The 1967 movie Guess Who's Coming to Dinner was built on the conventions of the drawing-room comedy, so the story makes the transition to the stage easily in Todd Kreidler's recent adaptation, now playing at Saint Michael's Playhouse. Kreidler keeps the key lines that stars Spencer Tracy, Katharine Hepburn and Sidney Poitier made memorable, and adds a few subtle updates. 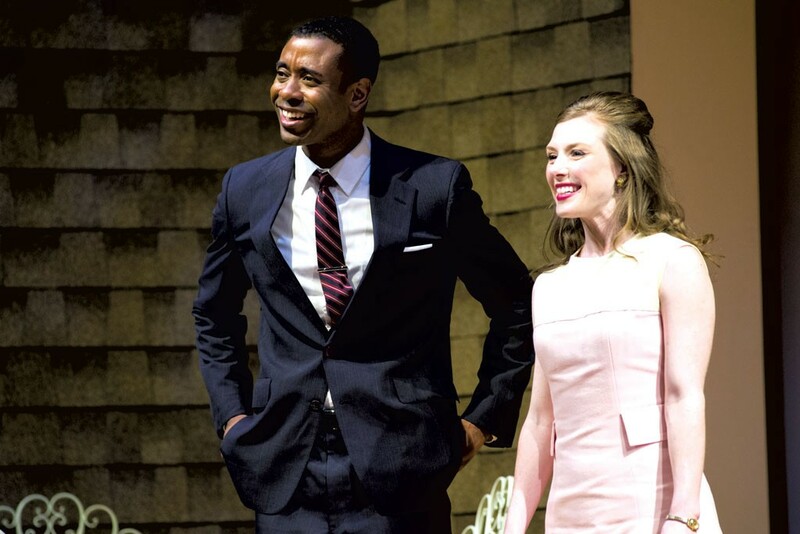 It's the late '60s, when it was perfectly fine to call yourself a liberal, as the white, well-off pair at the center of the play, Matt and Christina Drayton, proudly do. When their daughter, Joanna, stuns them by introducing her African American fiancé, the Draytons' pro-civil-rights principles are put to a real-life test. Dr. John Prentice is a paragon, the beau any parent would want for a son-in-law provided they could accept the color of his skin. John asks for Matt's approval of the marriage, placing the couple's future in Dad's hands. Weighing in on the question are family friend Monsignor Ryan; the Draytons' black maid, Tillie; Christina's business associate; and John's parents. In effect, seven people line up like bowling pins to have their biases knocked out of them. It's a little surprising to see where the couple finds its first ally and its last converts, but eventually all the pins do fall. True to Hollywood, the movie Guess Who's Coming to Dinner was both courageous and craven. Interracial marriage was still illegal in 17 states until a few months before the film was released, and tackling the subject in a positive light was heroic. On the other hand, the picture-perfect black doctor, played with supreme serenity by Poitier, was constructed to soothe a white audience, not to tell an African American's story. Kreidler's 2013 stage adaptation of William Rose's screenplay preserves not only the story but the dramatic mechanics of the movie. Seeing the play today is a trip back not just to different standards for interracial relationships but to a very different style of drama. Each character has a big speech, during which others listen thoughtfully and have their minds changed. As soon as the subject matter grows a little intense, a laugh line diffuses the tension. The exposition is a bit forced. And, as a snapshot of society, the play relies on severely exaggerated characters to prove a thesis. But its key characteristic is the principle that eloquence can change attitudes, a notion that seems especially quaint in an age when the internet is used to reinforce, not challenge, belief. These qualities aren't dramatic flaws, but they will seem stiff and starched to viewers of contemporary plays, not to mention movies. The abiding feeling is that time has tamed this story and this style of storytelling. The professional cast is well polished. As John, James Brown III is poised and unthreatening, but he gets to show a bit of fire in a confrontation with his father. Dorcas Sowunmi basks in Mississippi sass as Tillie, and Sarah Carleton shows unwavering strength as Christina. M. Emmet Walsh draws lots of laughs as the Monsignor, and Mark Zeisler, as Matt, is equally at ease showing a sitcom dad's exasperation and true moral wisdom. Dramatically, conflict is only fascinating when it produces a change, and in this play it's words, not deeds, that convert characters. When Matt says that the two lovers will not have to be the recipients of society's disapproval but can be the embodiment of its tolerance, his declaration is stirring. In a play, stirring words are enough to change a character's mind in an instant, but social standards evolve more slowly. Often, change starts when a work of fiction gives new ideas a place to audition for acceptance. This play's core ideas are old now, and director Kathryn Markey wisely treats the play like a period artifact. She doesn't attempt to renovate the classic drawing-room conditions for a story like this, just affirms them by making a virtue of the limitations of a sofa and two chairs. Markey is a conscientious constructor of stage pictures, deploying the large cast in attitudes of active listening to the set-piece speeches. Her direction keeps it lively, and the crisp pace is a welcome counterpoint to the script's relatively sluggish portrayal of characters doing a lot of thinking out loud as they slowly digest uncomfortable ideas. However, the fast clip means Markey doesn't dawdle long enough to establish much chemistry between the young lovers, or even to allow any suspense about the outcome. The impressive scenic design by Lauren Mills takes full advantage of the theater's wide proscenium stage to create a picture of casual California style. A paneled Mission door and a ceiling rake signaled by a slope in the high walls add texture to the big interior space; a downstage garden a level below the main playing space is nicely defined. Much of the time, lighting designer John Paul Devlin illuminates the big set with the bright intensity comedies need. But he adds lighting changes to put exclamation marks on even small mood shifts. The impulse to narrow the light to frame the couple or darken it to signal trouble is fine, but the execution here is so bold that it reads like running commentary on the story. The play is a comedy of changing manners, and it's constructed like a courtroom drama with a parade of witnesses on the subject of racial tolerance. The climax is a summary for the jury of the audience, with oratory designed to help us all find the way to enlightenment. If the 1967 formula for overcoming prejudice looks a little naïve today, perhaps it's because we're starting to get past white people taking comfort in their high-mindedness. Sitting in what seemed to be an all-white audience, I could feel pride that an interracial kiss no longer prompts a gasp, but also some sorrow that we may be congratulating ourselves far too soon. This solid production is a chance to revisit a cultural milestone, but the journey isn't over. The original print version of this article was headlined "In Black and White"